Look down at your feet and wiggle your toes. I bet most of you have wiggle room. That's because we usually buy shoes at a store with room to grow. A long time ago, everyone had their shoes made by a shoemaker. The shoemaker traced people's feet and made a pattern just their size. The patterns were used to trace leather. The pieces of leather were carefully cut out and sewn together to make new shoes. Making shoes was hard work, and sometimes shoemakers didn't make very much money. There once lived a hard-working shoemaker and his wife. He worked in a small shop that was also his home. The shop was a little room that opened onto the main street in town. Once the shop had been filled with customers. But, for a long time business had been slow. Fewer and fewer customers came in to buy new shoes or to have their old shoes repaired. In time, the shoemaker became very poor. Soon he had only enough leather in his shop to make one single pair of shoes. Since no one had come into the shop to have his or her feet measured lately, the shoemaker could only guess about what size shoes to make. He cut out the leather and laid it out to stitch in the morning. Then the shoemaker and his wife said their prayers and went to bed. When they got up the next morning, the shoemaker looked for the leather that was cut out the night before. Instead of pieces of leather, both were surprised to see a finished pair of shoes were sitting on his workbench. Just as they were trying to figure out where the shoes came from, a customer walked into the store. The shoes were the perfect size for the customer. They were so well made that the customer paid an excellent price for them. The price was so good that the shoemaker was able to buy food to eat and to purchase enough leather for two more pair of shoes. He cut out the leather for the next morning before going to bed and put it on his workbench. Then, the shoemaker and his wife said their prayers and went to bed. When the two got up in the morning, they were amazed to see two brand new pair of shoes sitting on the workbench. The work was the finest the shoemaker had seen. As the shoemaker held both pairs up to examine them, two customers came in to buy them. The shoemaker had enough money now to pay his bills and to buy leather for four pair of shoes. He cut out the leather once again to make the shoes the next morning, said his prayers and went to bed. The next morning, the same thing had happened. Four pair of shoes sat neatly arranged on the workbench. This time, the shoemaker and his wife had enough money to add to their savings and give money to charity. The four pair sold for enough money to buy leather for eight. Eight pair became sixteen. Sixteen became thirty-two and so on. This happened day after day until the shoemaker and his wife were quite rich. One night, the shoemaker's wife said, "Instead of going to bed tonight, can't we see who has given us all this help and made the shoes for us?" Both agreed that this was a good idea. They wondered out loud what kind of a person or creature had been helping them all along by making all of the shoes. Both agreed that this was a good idea. They hid behind a cupboard and waited to see the shoes being made. What the shoemaker and his wife saw amazed them both. At the stroke of midnight, they heard light footsteps coming into the room. Only a few moments later, they heard the sound of a hammer hitting the awl - a punch that make holes in the leather where the thread would go to sew the pieces together. They heard a hum of thread being pulled through the holes. The shoemaker and his wife peeked over the cupboard and saw two little elves. At first, they could only see the tops of their heads. The elves had golden hair that looked as smooth as silk. The shoemaker and his wife looked at each other as if to ask, "Do we dare to raise up to see more?" Then both shook their heads up and down and rose up higher behind the cupboard. They could see the faces of the elves that were busy with the work that lay before them. The elves had pointed ears and large beautiful eyes. Their eyes were bright and happy. They had small button noses that twitched with pleasure at the smell of the fresh cut leather. The elves sat at the workbench and rapidly began to piece together the leather that had been laid out for them. They stitched and hammered happily throughout the night. Their needles moved so fast that neither the shomaker nor his wife could follow the hands of the elves as they sewed. It was hard to keep silent while all this happened. The shoemaker and his wife looked at each other and shook their heads in disbelief. The elves finished their work as the first of light of morning started to appear and jumped down from the table. They turned their backs to the shoemaker and his wife to line up all of the pairs of shoes on the display shelves at the front of the store. 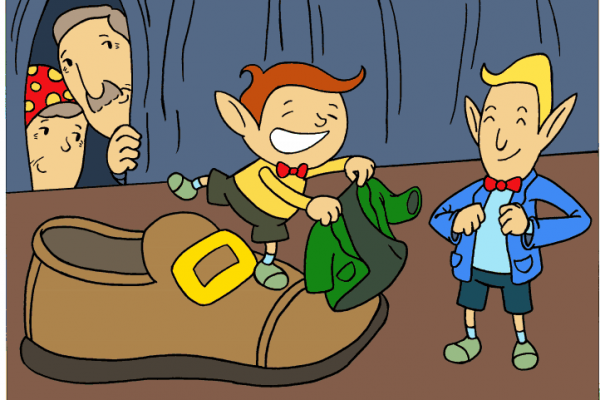 This was the first time the shoemaker and his wife dared to stand up a little higher and see what the rest of the elves looked like, and my were they shocked. They saw the elves from the backside, They were as naked as can be! All of the shoes they had made - the elves had not kept a pair for themselves. Not only did they have no clothes, but they had no shoes. As the first rays of light entered the store window, the elves disappeared. The shop was so quiet after a nighttime of tapping. The display shelves along the front window of the the shop held dozens and dozens of pairs of shoes. The shoemaker and his wife whispered to each other from behind the cupboard. They still were almost afraid to talk out loud for fear that all of their good fortune would disappear. Finally they stood up - their old bones aching from a night of kneeling on their hands and knees. "Goodness, my goodness," said the shoemaker's wife. Imagine - those naked little men being so kind to us. They must be terribly cold running about with no clothes on. I simply have to make their some underwear and some shirts and pants and stockings. And you must sew them each a good pair of leather shoes." The shoemaker loved his wife's idea. Of course that was one of the reasons he had married her. She was smart and always had good ideas! By that evening, the shoemaker's wife had sewn clothes for each elf, including a coat and pointed hat for each. And the shoemaker had done his best work making two new pair of shoes that he sat next to the clothes. This time, they left no leather to be sewn. But, they did leave a candle burning next to the clothes to light up the room. Then the shoemaker and his wife hid once more behind the cupboard to watch. Promptly at midnight, the elves came through the door ready to begin their work. But, there was no leather set out for them. Instead, they saw two sets of clothes - just their size - for the shoemaker's wife was very good at guessing sizes. The two elves smiled from pointed ear to pointed ear. They put on the clothing right away and began to sing in their excitement. They were used to helping others - but did not believe in asking for anything in return for their labors. But to be given a gift that was not asked for ---- that's the best type of gift one can receive. They finished dressing and began to dance around and around. For a few minutes, they broke into a clog that looked like step dancing. They danced around the workbench, and they danced on top of the workbench. They tapped and they spun - laughing the entire time - then they saw the eyes of the shoemaker and his wife looking at them. They winked with happiness to say thanks and without a word disappeared out through the door. From that time onward, the shoemaker and his wife never saw the elves again. Now they had enough money to live - but still worked for the love of working. They always remembered the kindness that had been done for them and did kindness after kindness for others.